Are you an experienced scrapper who has lost your mojo? Do you want to go to the next level with your layouts? Do you wonder why your layouts just don’t look “done”? 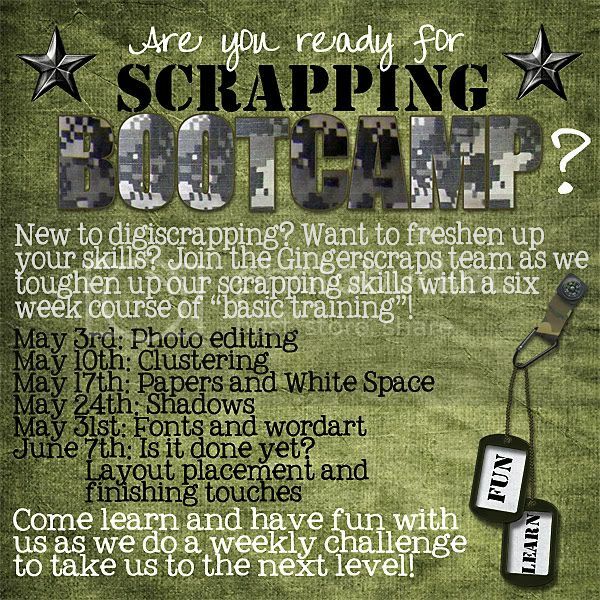 or are you a brand new scrapper who wants to learn “everything!”? Join the Gingerscraps team for an intense 6 week basic training course that will help you grow as a scrapper! We will have weekly tutorials, prizes, CC, and lots of fun! Click on the flyer or HERE to sign up in our forum.